A local group is leaving a lasting impression with sand designs that wash away all too soon. 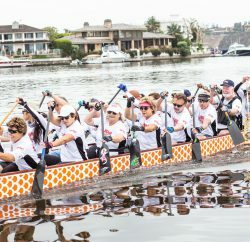 It all started early one morning when Laura Wright and her daughter Darla came down to Newport Beach intending to surf. The tide was low and sucked out, so the waves weren’t any good. Rather than head home, the duo picked up some sticks and started doodling in the sand. 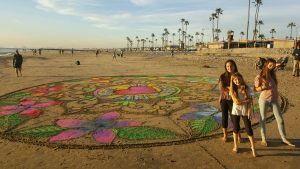 The pair completed just a few flowers that first morning, but an idea—one that would extend, spiral and coalesce into something of a community effort—had sprouted thanks to the lines they’d drawn in the sand. Sitting down to talk about their endeavor, which defies definition given its installation/street art/neonaturalist vibe, Laura smiles widely when she speaks, her bright and gentle eyes peeking out from beneath an RVCA cap. 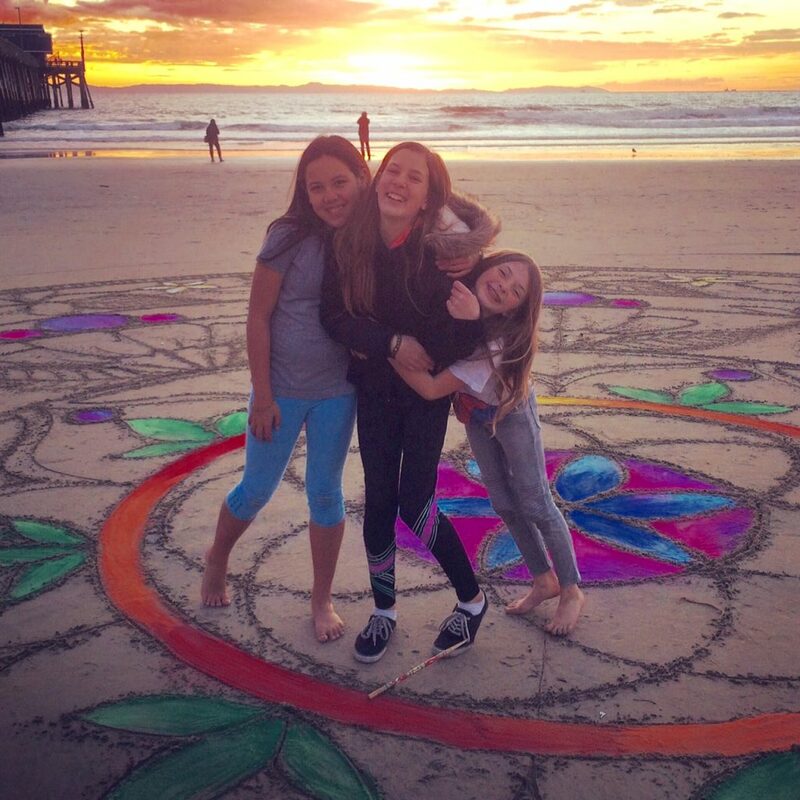 The group of artists, self-named the Low Tide Aliens, includes Darla, 12, and her cousins Mila Martin, 10, and Kaitlyn Butler, 12. 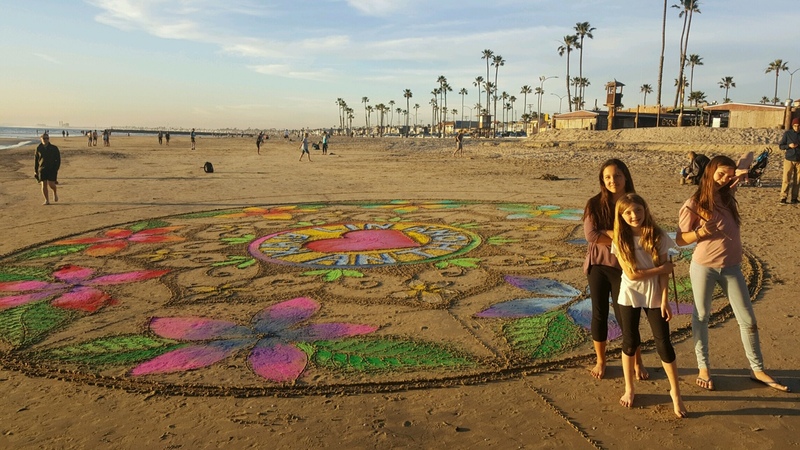 The all-female, Newport Beach-based group started the project two years ago and have been making large-scale, colorful sand art on the beach near Newport Pier, typically on weekends whenever the tide is lowest, during new and full moons, ever since. To date, their show-stopping designs have ranged from flowers, trees and mandalas to a Phoenix rising from the ashes, a Dia de los Muertos skull, and a pink ribbon in honor of Breast Cancer Awareness Month. 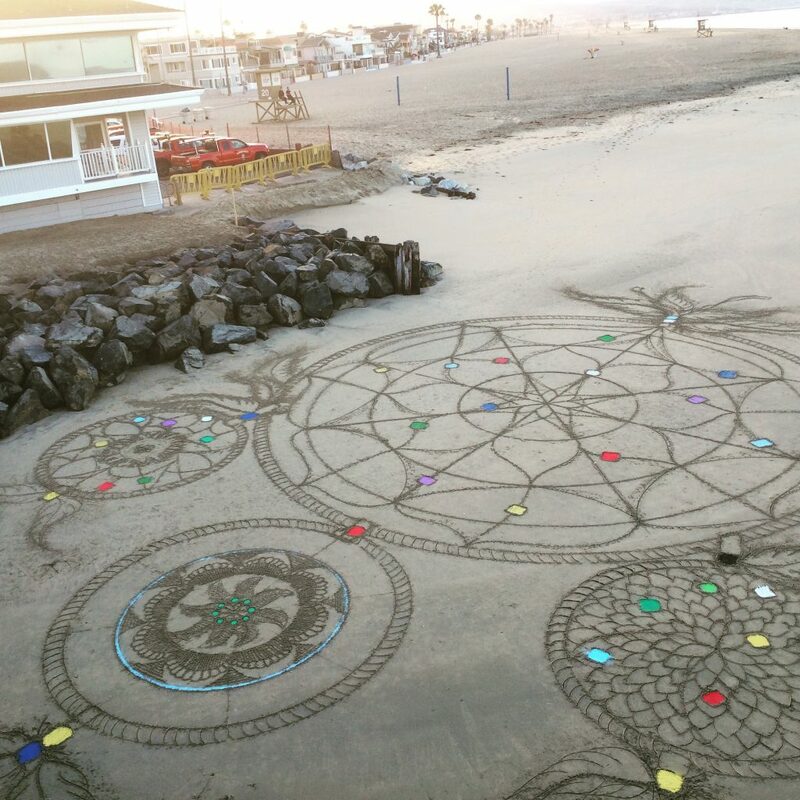 Mandalas—intricate designs within a circle—are a recurring theme for a group of artists calling itself the Low Tide Aliens. 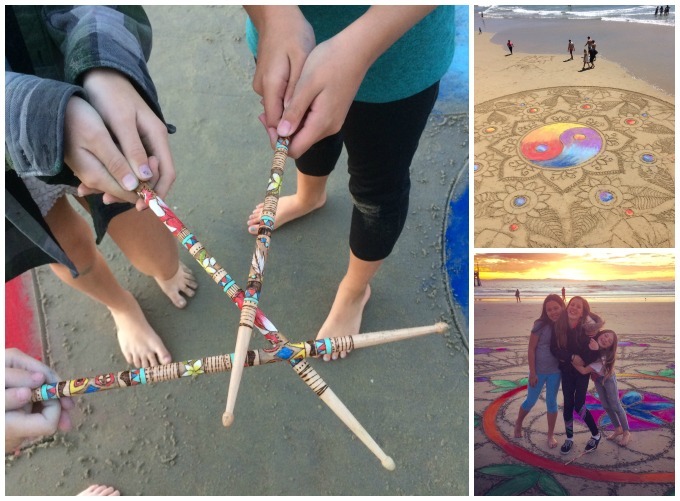 After Laura and Darla’s first attempts, they started getting more creative on subsequent trips, eventually graduating from sticks to drumsticks and using string to create giant circles in the sand—a natural shape for mandalas, their design method of choice. 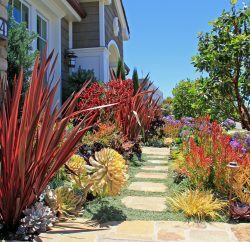 They invited Darla’s cousins to join them and, recently, the group has added nontoxic colored sand to set certain pieces apart and make things pop. The dimensions of each design vary, depending on how early the “aliens” get to the beach. In a perfect scenario, they have just two hours to work with—an hour before the tide is at its lowest, and an hour as it comes back up. The best sand is closest to the water, so they can’t be too far up the shore if they want distinct lines. True to the unruly nature of their chosen canvas, the aliens rarely have a fully fleshed-out sketch when they come to the beach. Most of the time, an idea (generated the night before, during a sleepover) is enough. One recurring design the team has spent a lot of time exploring is the mandala. Several ancient cultures have used the mandala as part of their healing rituals; for Laura and the girls, the art they create definitely has that effect, not just on them, but on the crowds they attract. Working right below the Newport Pier, anytime people stop to watch or take pictures, the team rallies them to jump in, grab a stick and help out. Spontaneous interaction and community involvement is at the root of what the aliens hope their artwork can accomplish, plus adding some unexpected beauty in the world. For instance, when a friend and neighbor approached Laura about doing a pink ribbon for Breast Cancer Awareness Month, the group jumped at the idea. Recently, a man commissioned the group to create a piece that aided him in proposing to his girlfriend (she said “yes”). “My mom wanted to do something more organic, right? That’s what you call it?” Darla begins. The girls laugh. “Sometimes we’ll finish and go up on the pier to listen to what people have to say. They won’t know it’s us who have done it. It’s fun to be a little anonymous,” Laura finishes. “Sometimes we say, ‘Hey guys, did you see the amazing sand art down there? You should totally go check that out,’ ” Mila adds via Facetime during the interview. Sometimes, when they’re working against the lunar clock, the aliens must work even faster than normal to contend with the rising tide erasing what they’ve done before it’s even complete. 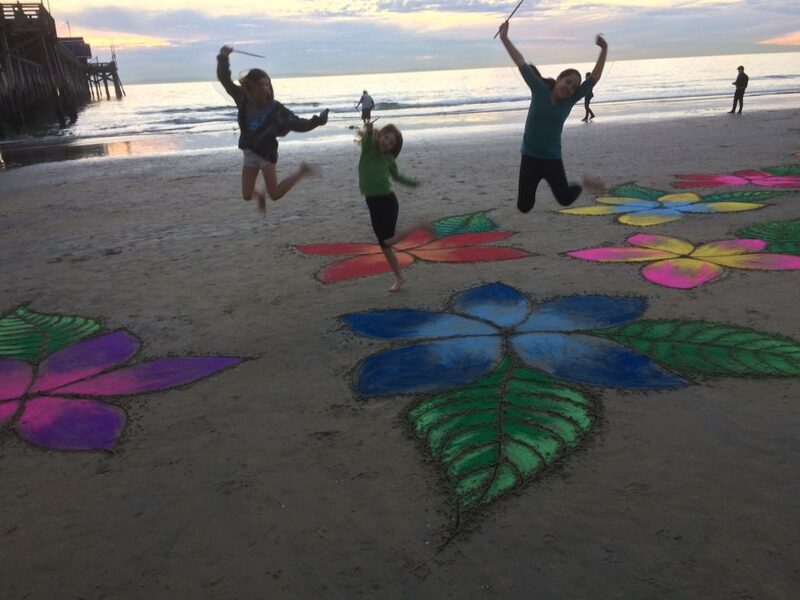 Drumsticks, a string and nontoxic colored sand are the tools of choice for making these designs on the beach. Regardless of how many photographs onlookers take before the mandala or tree or flower designs fade back from whence they came, the Low Tide Aliens are happy just being on the beach, in each other’s company, making something—unexpected, lively, fun—with nothing but a handful of drumsticks, a string and some brightly colored sand. The Low Tide Aliens offer tips for making your own sand art. Bring a stick and a string: A perfect circle can’t be made without these tools. Don’t use your finger (sand under the fingernails is not fun). Enlist a few friends: It’s difficult, if not impossible, to make these designs alone. 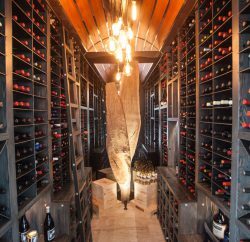 Plus, it wouldn’t be as fun and would take much longer without some assistance. Get to the beach early for a clean canvas of sand that’s less marked by footprints and other people’s drawings. Just have fun and don’t try too hard.